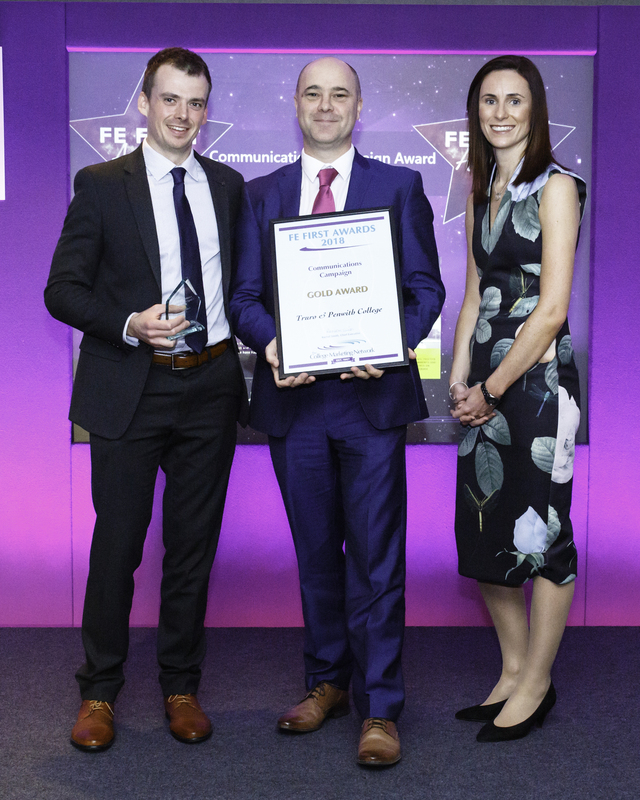 Head of marketing Matt Bond (centre) with deputy marketing assistant James Gool and Jo Maher at the 2018 FE First Awards. Truro and Penwith College’s marketing and communications team has been recognised at a national awards ceremony for its campaign work on the new Callywith College in Bodmin and the Stadium for Cornwall. The college’s marketing team, which supports marketing across the college as well as supporting external partner and project campaigns, collected two Golds and a Highly Commended in the 2018 FE First Marketing Awards. The awards were presented at a glittering award ceremony in Warwick, hosted by the College Marketing Network and presented by Jo Maher, principal and CEO of Lincolnshire’s Boston College. The team’s involvement in securing public investment for the Stadium for Cornwall project was highlighted as “outstanding”, winning the highest Gold award in both the best Communications Campaign and Partnerships and Collaboration categories. Truro and Penwith College also collected a Highly Commended award in the Targeted Student Recruitment category for promotion of the new Callywith College in Bodmin, which opened in September 2017. The College’s head of marketing and communications, Matt Bond, said: “The marketing team at Truro, Penwith and Callywith College has gone above and beyond this year in extending its reach to include two large scale projects that have socio-economic impact across Cornwall.